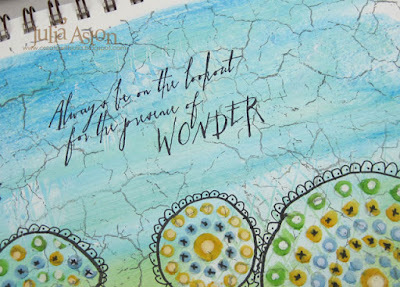 Today I have two journal pages to share that I made for the Wanderlust Book Prompt challenges. 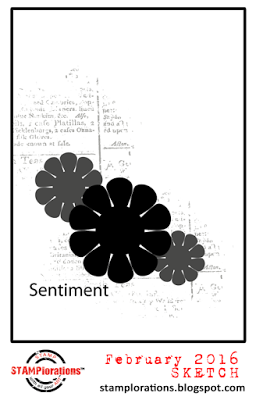 Every two weeks Kasia has a word prompt for us to inspire a journal page. I have trouble figuring out what I want to do on journal pages so I got a little behind on the challenges! So this weekend I was determined to sit down and get the latest 2 done! 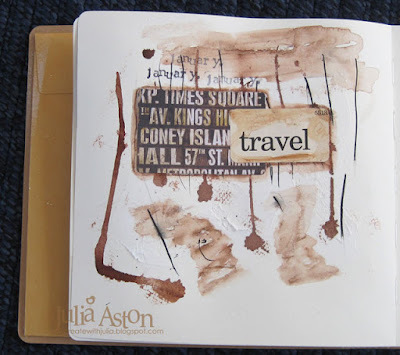 For this page the prompt was " What I really want is......."
and I decided what I want at this moment is to travel! 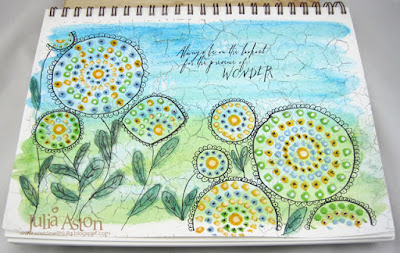 To make this page, I first covered the center of the page with Wendy Vecchi White Embossing Paste. 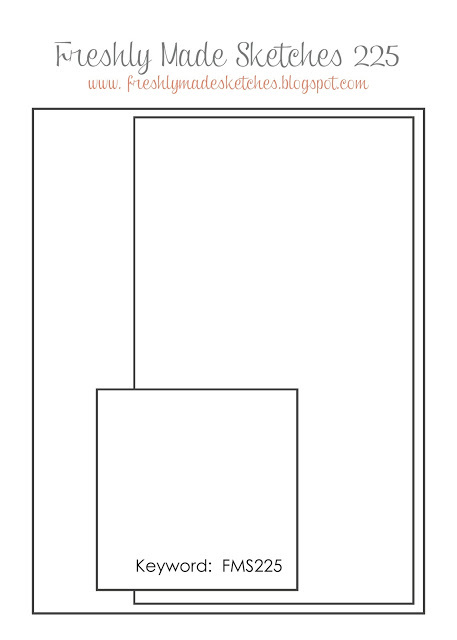 I didn't layer it on smoothly - leaving some lumps to add texture to the page. Next I dripped some brown Calligraphy Ink onto the page - pressing on the large drops that pooled at the ends with a paper towel to mop them up. Then I added lines with a pen nib and black India Ink. I adhered an Idea-ology Pocket card and Flash Card overlapping on the page. 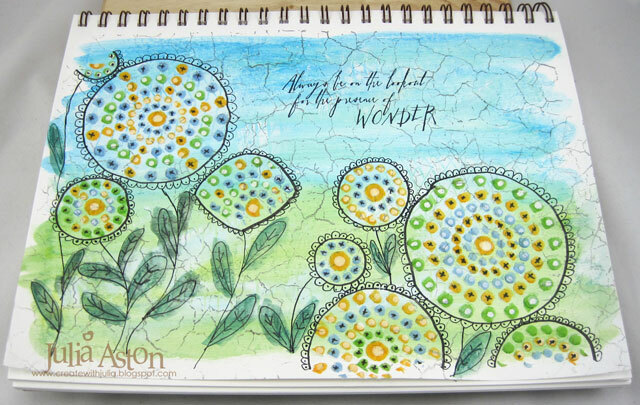 I drew some squiggles with a brown Neo Color Wax Pastel on the page and brushed over the marks with a water pen. To finish my page - I stamped the January stamp from Kasia's new Paper Artsy stamp set, since this prompt was a January challenge. My second page was made for the Feb 6 Wanderlust Book Prompt "Write a lot, write fast, fill the page" We have had several classes on using all kinds of pens and markers to journal with and also how to 'scribble' write. 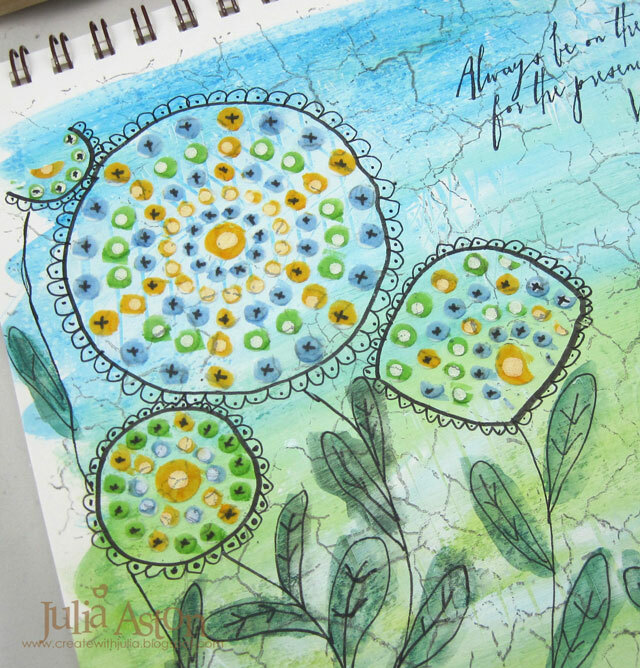 For this page - I first brayered Paper Artsy Fresco Finish Snow Flake paint over most of the page. 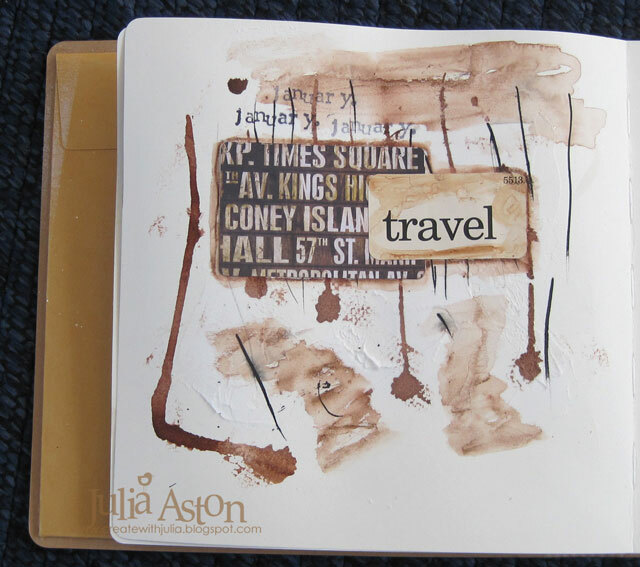 Then I brayered a little bit of Paper Artsy Claret and Guacamole Translucent paints on the page. When that was dry, I wrote some thoughts, writing quickly so it's almost drawing rather than writing - using a Big Brush Dark Indigo PITT artist Penn B. 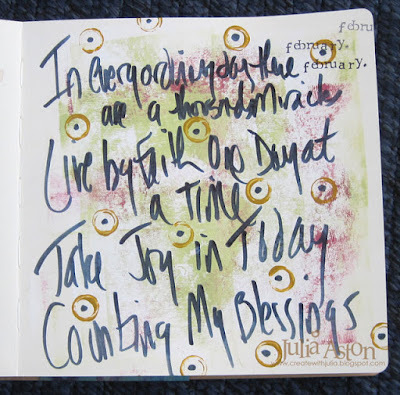 The things that I wrote are from stamps I have: In Every Ordinary day there are a thousand miracles; Live by Faith one day at a time; Take joy in today; and Counting My blessings. 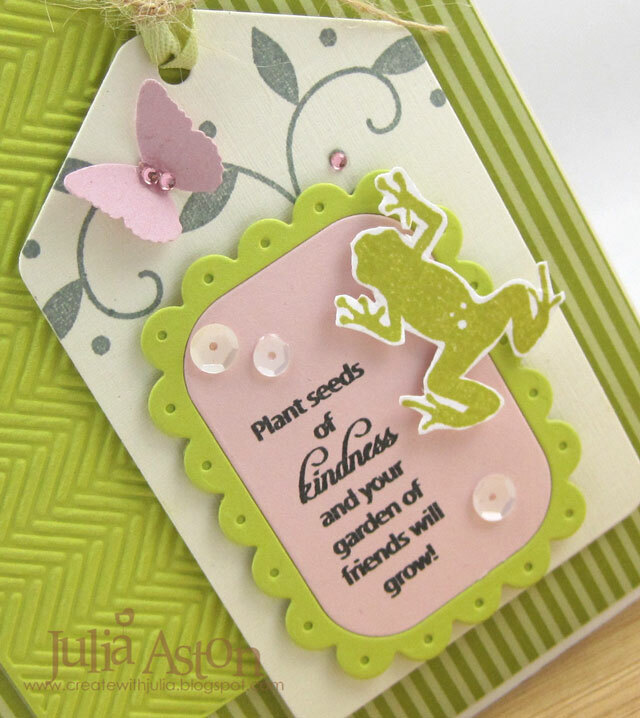 I stamped February 3 times in the top corner using Kasia's new stamp set. 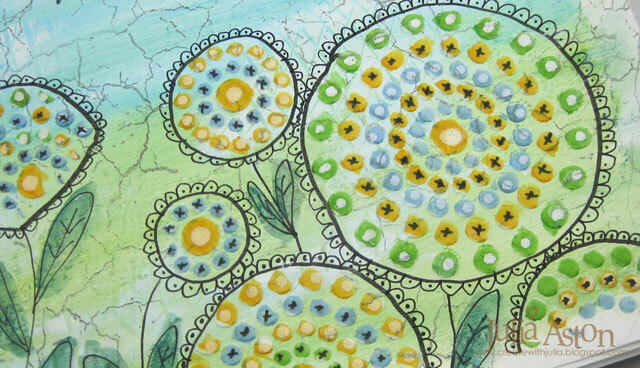 My page seemed to need a little something more - so I took a Hi-Lite yellow marker, dipped the round end of it in some Yellow Oxide Golden Acrylic Paint and 'stamped' the circles randomly adding black dots in the centers with my PITT pen. 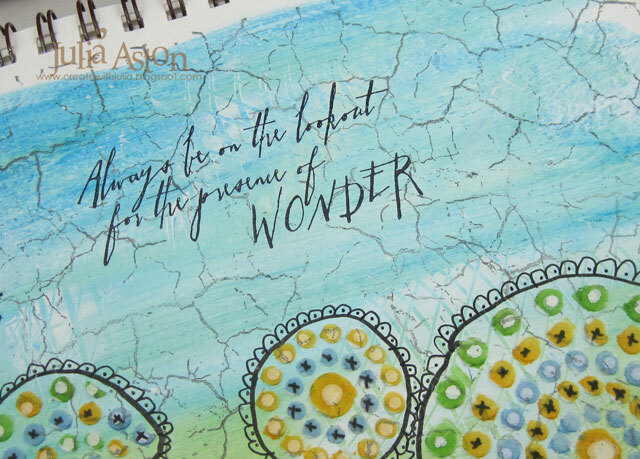 I am really enjoying the wonderful Wanderlust on line classes I'm taking. I'm being challenged to try new areas of art that I either have never done before or have only done a little bit so I'm learning a lot! 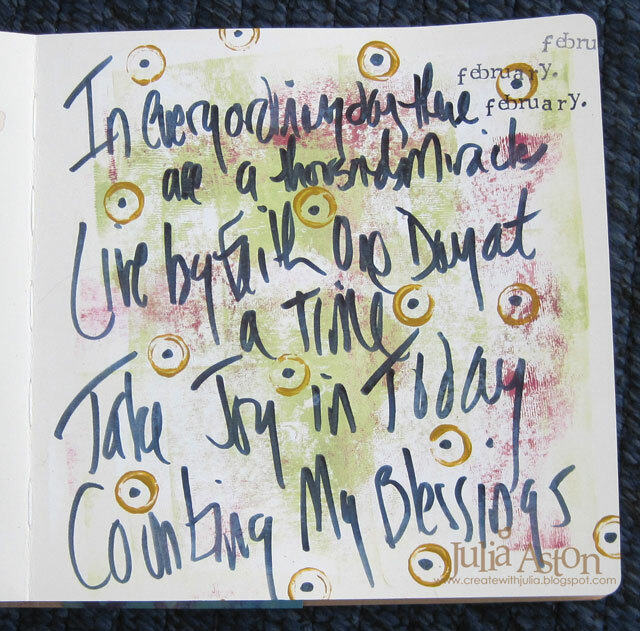 I'm already feeling more comfortable doing journaling pages! You can check out Wanderlust at Everything Art here. 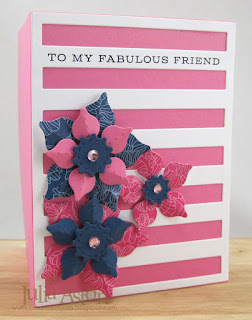 It's time for the PapertreyInk February Blog Hop - always such a fun challenge to participate in! 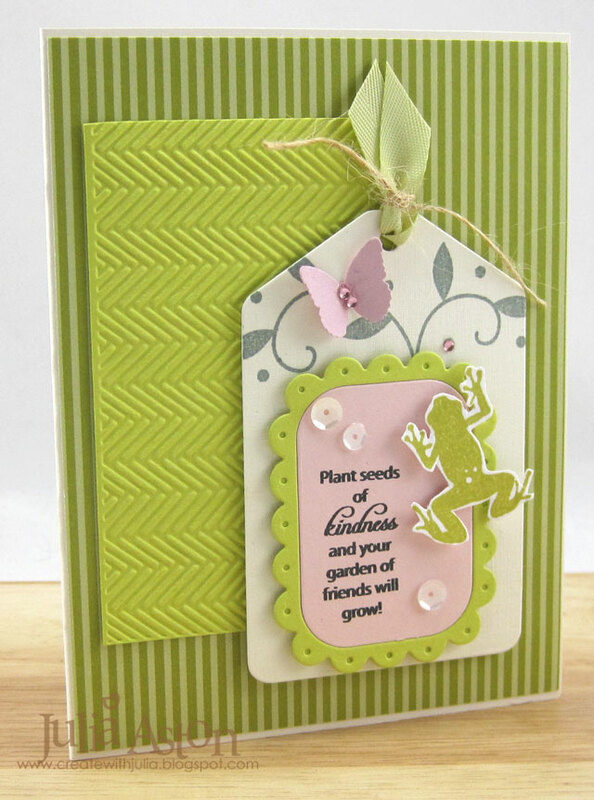 I focused on the colors, the little frog and butterfly, the glitter, the design on the green napkin and gray pattern on that little pink panel sticking out on the bottom left! Pretty much everything on my card is PTI, accept for the embossing folder, the butterfly, sequins and gems. All the stamps I used are now in The Vault (older sets). The frog is from - Pond Life, the sentiment is from Flower Garden Sentiments, the stem stamp is from Beyond Basic Borders. The tag is Tag Sale #10. The papers are Limeaide Ice, Sweet Blush, Vintage Cream (card base), Vintage Cream Linen (tag base), the ribbon is Spring Moss Top Notch Twill that I tied with a piece of twine. The striped background is from Simply Chartreuse Paper Pack. The frog, the scalloped tag piece and the tag base are all layered with foam dots. I always enjoy seeing what stamps the other blog hoppers are inspired to use! 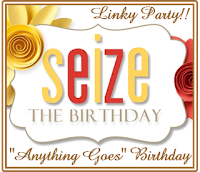 You can find everyone linked up over at Nicole's Blog. Accessories: Tag Sale Die #10 - PTI, Martha Stewart Butterfly punch, Avery Elle Winter Blend Sequins, Tiny Twinkles - Taylored Expressions, Herringbone Embossing Folder - Provo Craft, Spring Moss Topnitch Twill and Twine - PTI. Yes - here's another Christmas card I've made for my stash! 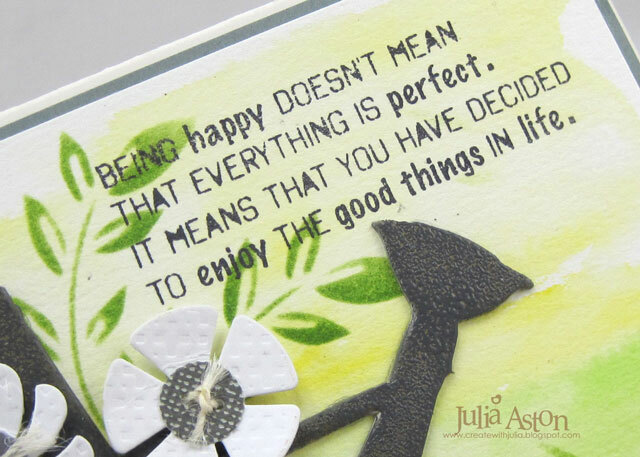 But it's also a card for a rather sad occasion - Claire has announced that she is closing Waltzingmouse Stamps on March 31, 2016 :( I have been on her Design Team since she first gathered one almost 7 years ago and I have just loved using her creatively designed stamps, templates and dies for all of those years. 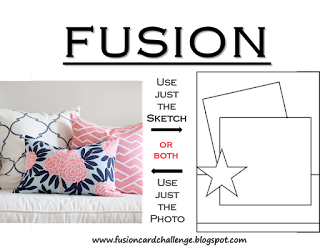 You will find her announcement here. 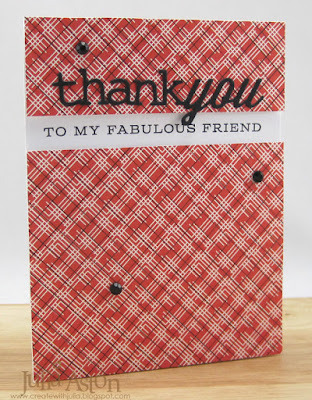 The one star in this dark sky is that Tara and Deborah - over at Waltzingmouse Fanatics - are running a blog hop to honor Claire and to let her know we care about her and want to show her some love - where everyone can link up their cards (newly created or old ones) made using Waltzingmouse stamps. The link will be open until March 31. 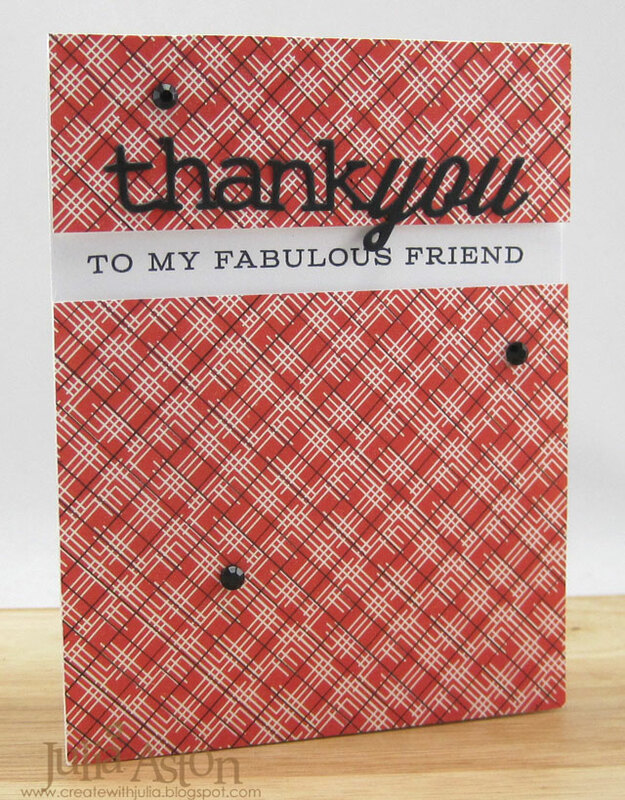 So - here is a card I just made using Folk Art Christmas Additions stamps and dies as well as the Pretty Circles die. I embossed the sentiment onto dotted vellum and layered the panel over the gold foil panel. I die cut and gold embossed the bell and layered it over the Pretty Circles die with foam tape, looping a piece of thin gold thread through the top. I added a few sequins to finish it off. 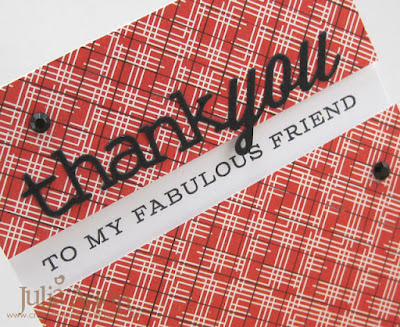 So Thank You Claire - for all your wonderful Waltzingmouse stamp designs - I have so enjoyed using them all these years - and I wish you the very best in your future endeavors! 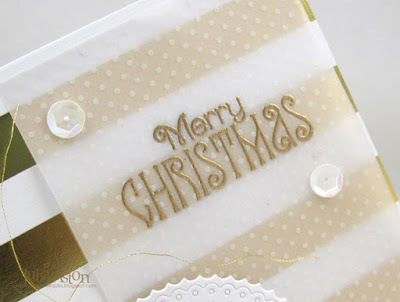 Accessories: Dies - Folk Art Christmas Additions, Pretty Circle Die - Waltzingmouse, foam dots, gold thread from stash, gold embossing powder, heat tool. 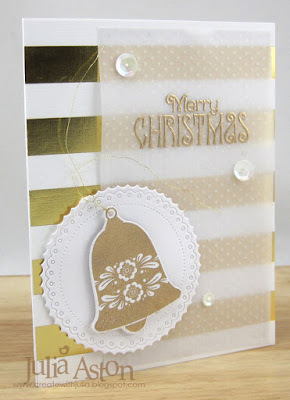 I'm continuing to build up my stash of Christmas cards for December - and today I have a one layer design to share. Simple and sweet! The sentiments from PTI Christmas Cheer are embossed in gold. 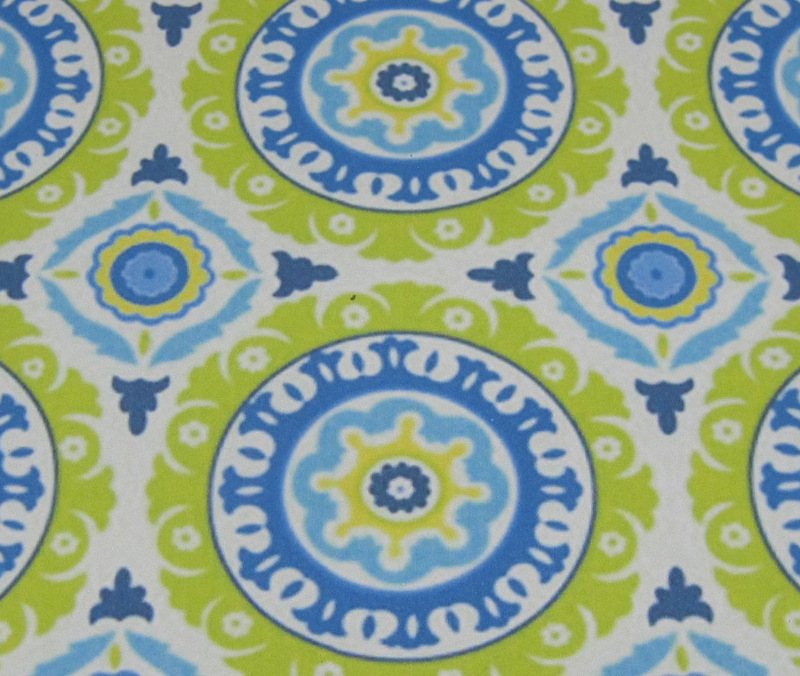 The holly and berries from WMS Festive Foliage are stamped in Simply Chartreuse and Pure Poppy. The sentiments really shine IRL and elevate a simple design to elegant - don't you think? I also gold embossed the sentiment that I stamped inside. 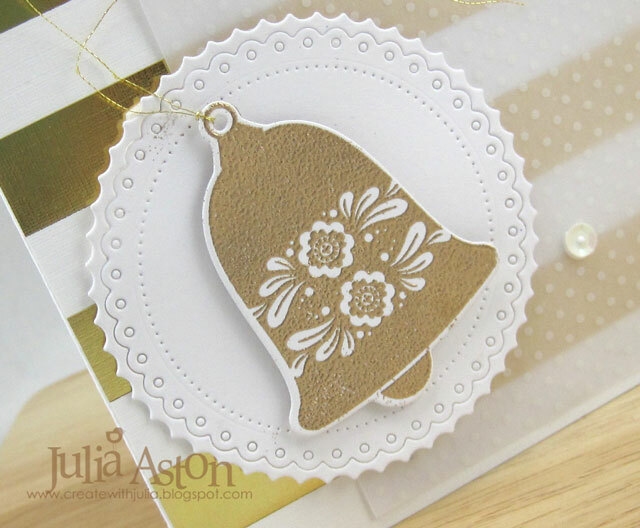 Accessories: gold embossing powder, heat tool. 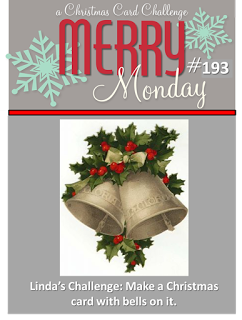 Today I'm joining in on the Inspiration Challenge over at Splitcoaststampers. 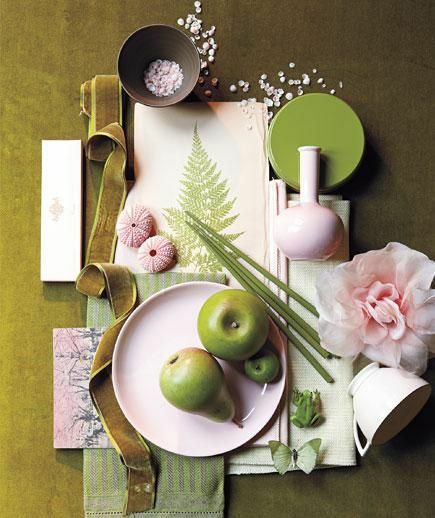 Geni is our guest hostess today and she chose a wallpaper web site for our inspiration - Total Wall Covering. I die cut the watering can out of matboard and embossed it using Tree Branch Ink and Watering Can embossing powder. 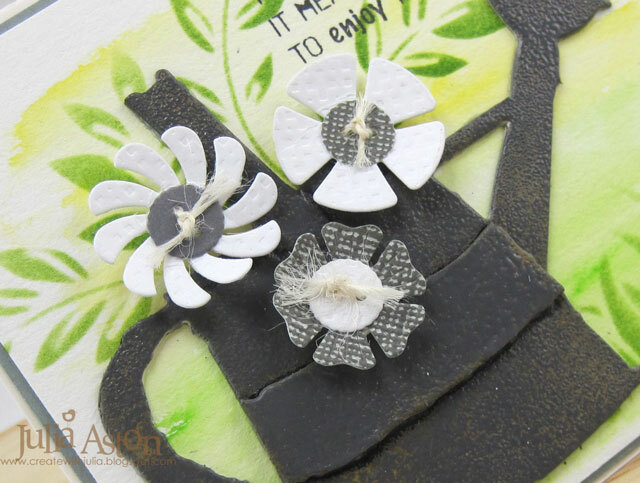 The flowers are die cut using PTI Button Dies. I tied twine through the button holes to give a little texture. I made the background using Zig watercolor brush pens - drawing over the area with the brush pens - then going over it with a waterbrush. 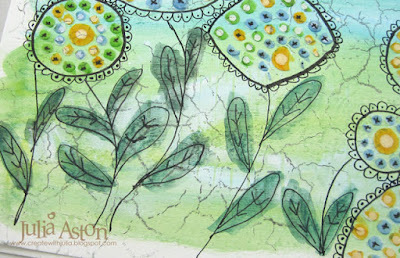 I stenciled the leaves and grass and added the sentiment after the background was dry. I'll be sending this card to my sister who is going through some difficult times right now. Paper: watercolor paper, Vintage Cream and Stormy Sea - PTI, Grey Bazzil, Little Sizzles Matboard - Sizzix. 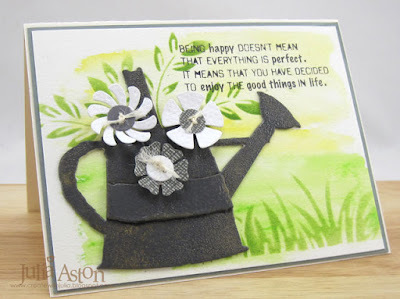 Accessories: dies: Watering Can - Tim Holtz/Alterations, Button Stack Set - PTI, Zig Water color brush markers - Black, Light Green, Yellow, twine - PTI, foam dots, From the Garden Stencil - Wendy Vecchi, heat tool, Wendy Vecchi Watering can Embossing Powder. 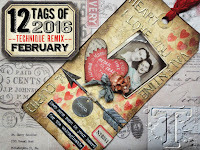 Well, more than half of this short month of February is past - so I thought I'd better get shaking on making my Feb Tim's Tag! 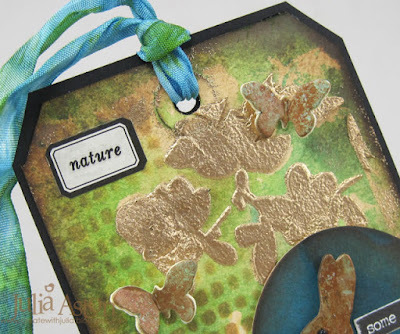 I love both of the techniques he has reintroduced - Monoprint from his June 2014 tag and Embossed Texture Paste from his March 2015 tag. See his instructions here and this is a photo of Tim's Tag. Since Valentine's day is long gone - I decided to use an Easter theme for my tag. For the monoprint background - I first sprayed my tag with Antique Linen Spray Stain and water - then dried it with my heat tool. I used the Blossom Stencil with Mowed Lawn, Salty Ocean and Shabby Shutters Distress inks rubbed on the back of the stencil - spritzed with water - then pressed onto the tag. 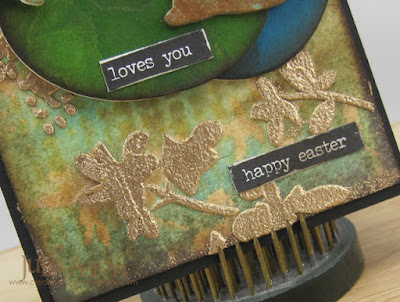 I used the same Blossom stencil for the Embossed Texture Paste technique using Wendy Vecchi White Embossing Paste and Ranger Gold Embossing Powder. 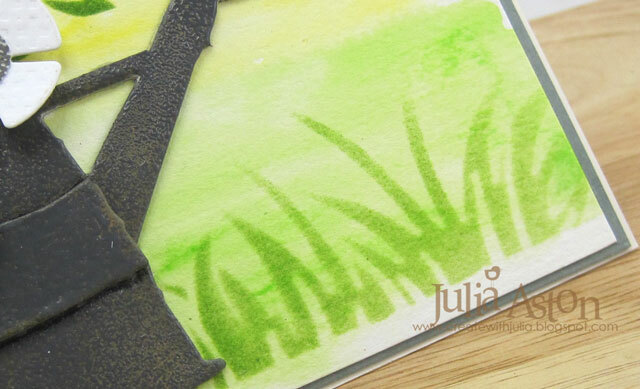 I rubbed a little Frayed Burlap Ink through the Burlap Stencil along the left side of my tag. I thought it might give the illusion of a woven basket. 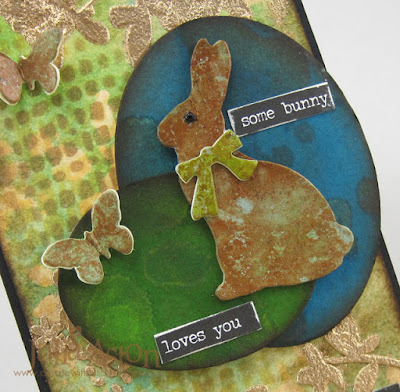 For my bunny, I used Tim's Rust Effect Technique (found on page 44 of Vol III Compendium of Curiosities) I took a piece of mat board and covered it with Cracked Pistachio and Weathered Wood Distress Paints, dried it with my heat tool, then rubbed Antiqued Bronze Distress paint to cover the panel - immediately spritzing it with water and then pressing a paper towel over it and removing it quickly. I die cut the bunny and bow from Movers and Shapers Mini Bunny and Bow. For the eggs, I used the Sized Ovals - Medium and Small dies cutting them out of mat board. I rubbed Salty Ocean on the small one and Mowed Lawn on the medium one - flicking water on them to create water spots and drying with my heat tool. I sponged the edges of the eggs with Distress Ground Espresso ink. 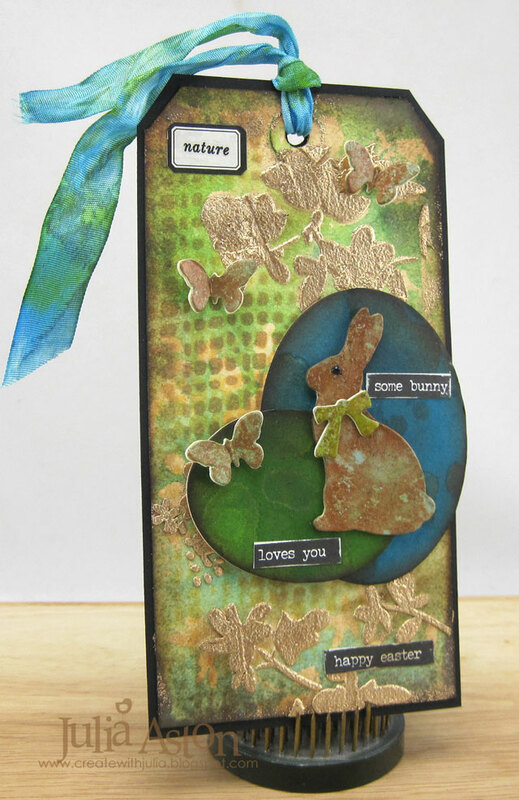 For a little dimensional decoration - I die cut 3 small butterflies (Movers and Shapers Small - heart, butterfly and star) out of the same colored mat board I used for the bunny, folded their wings up gently and adhered them just along the middle body to my tag. I added some Small Talk/Occasion stickers that I cut and sanded as well as a Vial Label with a Bontanical Remnant rub on it. 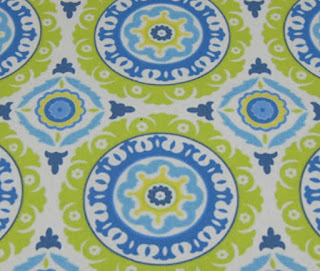 I colored the Crinkle Ribbon with Salty Ocean and Mowed Lawn inks spritzed with water. I had so much fun playing with these techniques on my bunny tag. 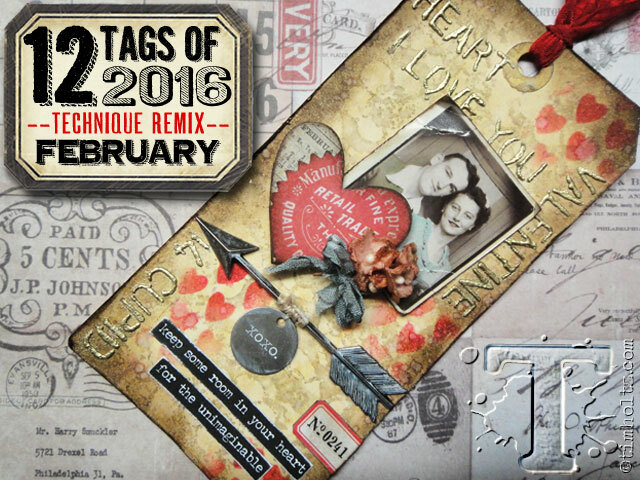 What a great idea Tim had to revisit and revise techniques from past tags for 2016! Accessories: Blossom and Burlap Stencils - Tim Holtz, Movers and Shapers dies - Small/Butterfly and Mini Bunny and Row, Ranger Distress Paints - Cracked Pistachio, Weathered Wood, Antiqued Bronze, Antique Linen Ranger Distress Stain, Idea-ology - Vial Labels, Remnant Rubs/Botanicals, Crinkle Ribbon, Small Talk/Occasioins, foam dots, Scotch Quick Dry Adhesive, Wendy Vecchi White Embossing Paste, Ranger Gold Embossing Powder, Tiny Twinkles - Taylored Expressions.